Regardless if one stays or goes, the garden must be planted, if only to provide beauty and pollination and fragrance a few brief months. In went the herbs, the annuals, the seeds. My neighbors and I will have salad with edible flowers, and maybe some one else will provide tomatoes. In the back, late autumn vines will open up with color. 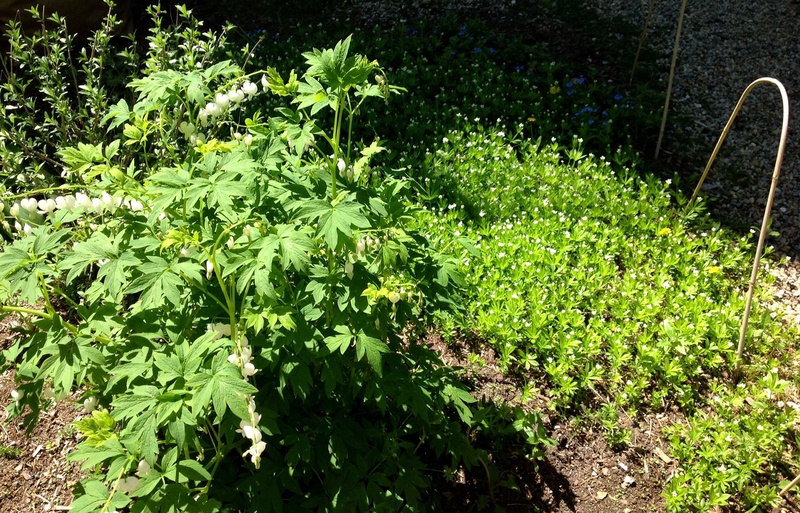 The columbines are nodding, the violas brighten, and foxglove emerges confidently. I have sprinkled love-in-a-mist, alyssum, poppies, and hollyhocks in between plantings, and will not pull any weeds except the most identifiable to give the green shoots a fair chance. Somewhere, inside one of the Shakespeare plays, is a gorgeous piece about flowers, about cowslips and lilies. For years, I put off adding a roses, thinking I will not be here long enough to enjoy them, but last year, I rescued three, and they have survived the terrible winter, as has the dicentra, clematis, cinnamon ferns, and sweet william. Why is it writing the name of flowers gives as much joy as being in the garden? What are you planting and tending? Let’s compare garden notes. to a 1st Light DJ in Hiatus…..Kris Delmhorst…..sings …of what you “write/speak”….EARLY EVERLASTING……http://krisdelmhorst.com/music/horses-swimming/ You can listen to her “FLOWER/garden/wild plant – Enthusiasm”….smiles…ch….thanks for your FULL-SPRING-time words…..
Okra have sprouted. Lettuces, beets and chard. Last year’s sage and kale have returned. If it were up to me, the entire front lawn would be turned over to okra. Their flower, similar to hibiscus, pale yellow petals around a warm brown center. We’ve cut a new path for varieties of lavender, Spanish, and Grosso. Mourning the demise of a bountiful fig tree, victim of beastly winter. Lily of the valley now running riot. Sweet scent of spring! Path of lavender and pale okra flowers : heaven! I have never seen okra flowers! Post pictures! I had tea in Heather’s Garden this week, under the Silverbell Tree. 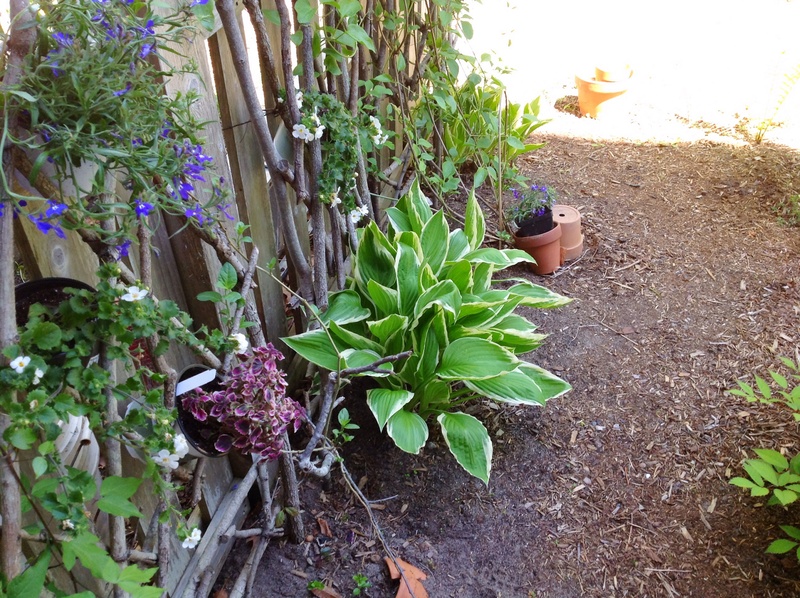 Heather created a Shakespeare garden and plants everything from seed. She gave us 4 of her tomato babies, which I promptly planted along the front walk, pushing the weeds aside to make way. 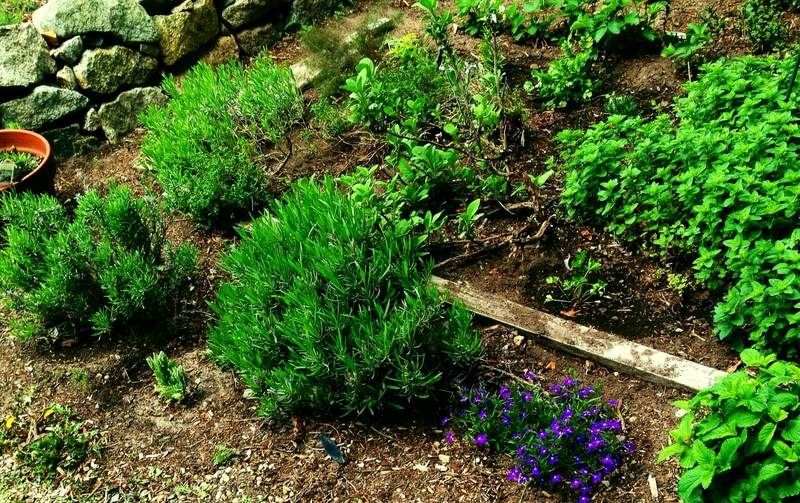 Most of the lavender along the path, both the french and english variety, had to be replaced this year. Bamboo grove is fascinating. I was in there yesterday, chopping down the broken ones. 15 feet tall! The grove was decimated by the snow, then ice that lingered too long on their branches. As I chopped and moved them, I tread lightly, for I have never seen so many baby sprouts. In the grove I felt a collective conscious to rally and repair after the long winter. This post was written for you, Di! A lavender scented hug to you.